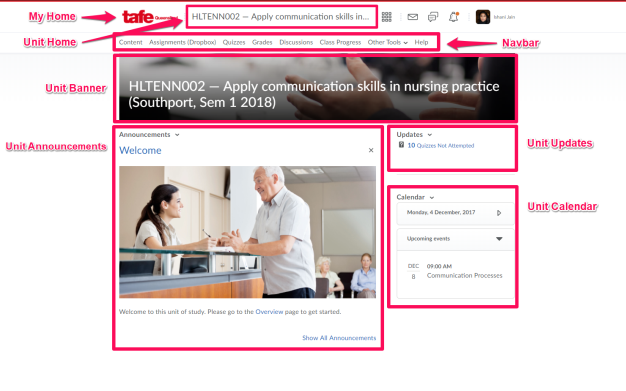 A reference guide for Students using Connect at TAFE Queensland. Every unit you’re enrolled into in Connect is a stand-alone area that begins with a homepage. My Home — A link back to the My Home page. Unit Home — When navigating through your unit, you can click this title to return to the homepage. Navbar — The navbar contains links to essentials tools in your unit, like Content, Assignments, Quizzes, Grades, Discussions, Class Progress, and more. Unit Banner — A visual reminder of which unit you’re currently in. The image matches the unit tiles on the My Home page. Unit Announcements — Stay up to date with tasks, updates and essential information for this unit. Unit Updates — Updates will remind you if you’ve got important outstanding information in this unit, like unread results, quizzes, discussions and more. Unit Calendar — Calendar shows you upcoming events added by your educator, like due dates, study schedules and more.